3 Mobile Wifi Device – More Road Worrier than Warrior. Thanks to the wonderful people at 1000Heads and 3MobileBuzz I have had a chance to play with the 3Mobile MiFi device. 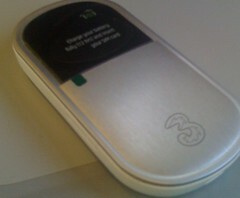 It is a wireless access point that uses a mobile phone sim to provide access to Internet via 3s’ data service. The advantage to using a Mobile Wifi (Mifi) Device over a traditional dongle is that battery power from your laptop is spared the effort of driving the USB dongle radio and modem. From experience the device has provided me 3 hours of work time vs the previous 1hr 10 minutes. Surfing speeds are faster since the networking and usb processing are not being carried out on the laptop. Its a great product , so why the worry ? First out of the bag, it is not very intuitive. Now I might be being overtly technical here but I would expect some sort of webinterface that lets me know I am connected and whats going on. To connect the device to your laptop and again to the internet requires several button presses and frankly these are not the easiest things to see negotiate. The flashing leds on the cover are not on by default ( yes its saving energy but its makes me think its not actually working) and when they are lit the colours are not consistent to an positive experience . Where I expect green for good, red for bad I find blue for connected and red for “its working” but I dont know why. Taking the above into consideration ( because I hate the phrase “that being said” ) I would at a pinch use this device for the sake that I have no other device to compare it against. I would hope that future releases take on board some of these criticisms and apply them. The device is available as Contract or Pay As You Go from all good stockists , etc. More testing… perhaps an altitude test?